Here at the Archaeological Conservancy as we celebrate 36 years of saving sites, we are about to purchase our 500th site! The so named 500th Site Pueblo, is an amazing 45-acre Chaco outlier occupied from A.D. 1050 to 1130, is located on a ranch near Grants, New Mexico, not far from Chaco Canyon. From A.D. 850 – 1150 Chaco Canyon in northeastern New Mexico was the administrative, spiritual, and economic capital of the Southwest. While Chacoan culture, with its dramatic great houses and concentration of monumental architecture, was centered within the canyon, its influence extended to more than 150 outlying communities spread across some 31,000 square miles in northwest New Mexico, southwest Colorado, southeast Utah, and northeast Arizona. A network of roads linked outlying communities with Chaco’s downtown. Its outlying settlements are critical to understanding Chaco, but these outliers are threatened by vandalism and oil and gas development. With your help, we can protect this rare piece of history. Your gift of $25, $50, or more for the Preservation Fund designated for the 500th Site Pueblo will make such a difference in our efforts to preserve this endangered archaeological site. If you donate $100 or more you will receive the fabulous commemorative T-shirt (pictured above). We need to raise a total of $45,000 to cover the purchase price, closing costs and fencing. 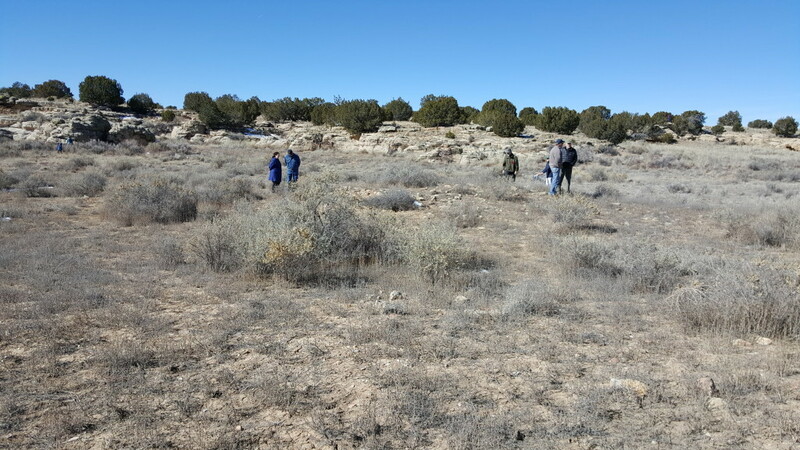 On-Site at 500th Site Pueblo, New Mexico. The Conservancy has preserved 46 Anasazi sites, some of which have Chaco-style features. Chaco sites consist of great house and small communities. Great house communities are generally extremely large, with multi-story buildings concentrated in central areas. Small communities are generally single-story structures with up to 16 rooms that are dispersed throughout the landscape. Both communities have kivas. 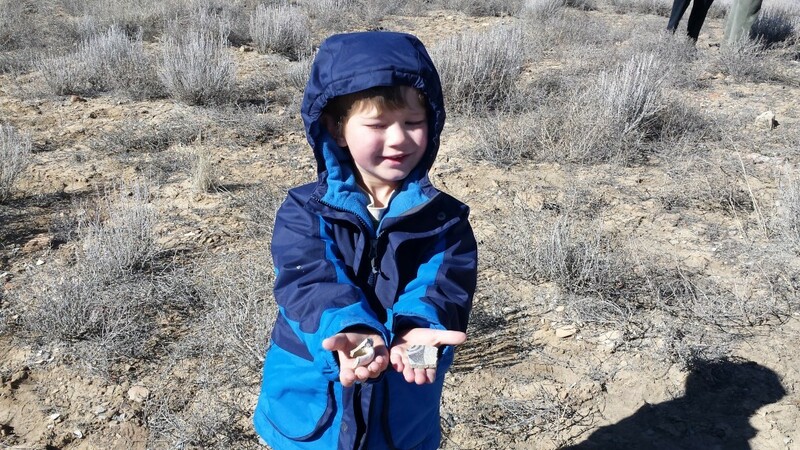 The 500th Site Pueblo was amazingly first documented just a few years ago in 2013 during an archaeological survey that was conducted in advance of the capping and stabilization of an abandoned uranium mine on the ranch. Just prior to the survey, the landowner told the archaeologists that there were more than 20 Chaco style structures on his property. The archaeologists got in touch with the Conservancy and let us know about this exciting site and helped set up a meeting with the landowner. 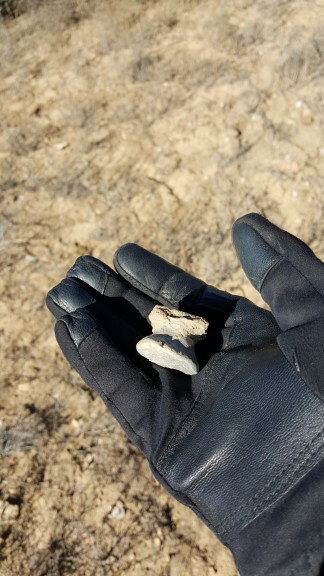 We toured a 45-acre parcel of his ranch that has a cluster of about a dozen or more dispersed masonry roomblocks that may be associated with another outlier just a few miles away. In the knee-high brown grass there are tell-tale signs of several rubble mounds rising above the flat pasture. These rubble mounds, consisting of sandstone blocks, are the remains of collapsed structures. Each mound has a trash midden nearby. 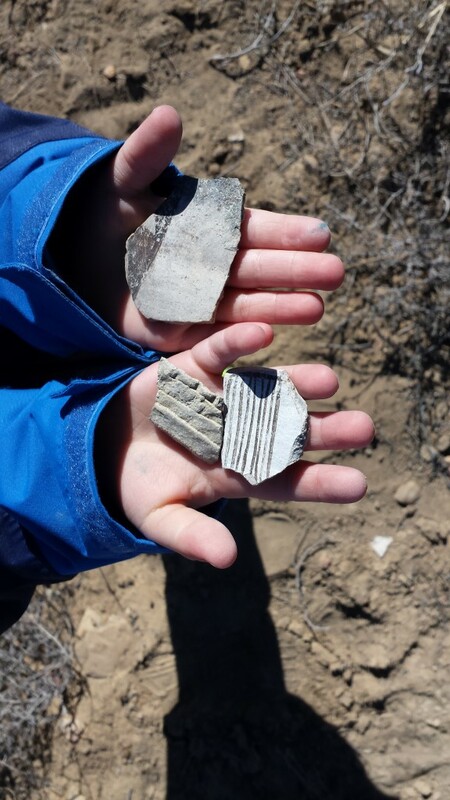 The site has an abundance of ceramics spread across the site including Puerco black-on-red and Gallup black-on-white – both associated with the height of the Chaco system. Other than gopher holes, there is no evidence that these mounds have ever been disturbed, a real rarity for Anasazi sites in the southwest. Recognizing the importance of the site, the landowner agreed to sell the site to the Conservancy to ensure its preservation. Despite more than a century of excavation and study at Chaco, archaeologists still differ over exactly what Chaco was. More questions than answers exist about the path that took Chaco from a vibrant cultural center to total abandonment. The Chacoan system underwent significant change in the early A.D. 1100s. Its center moved from the canyon north to the Aztec area, and its power in the region diminished considerably. Handle from a Chaco Vessel Found on Site. How was the Chacoan system, either ritual or sociopolitical, implemented far outside the canyon? What benefits would Chacoan Outliers have received through membership in the Chacoan system? To what extent were those benefits enhanced or diminished by their distance from Chaco? Your contribution to the Preservation Fund, designated for the 500th Site Pueblo, will make such a difference in our efforts to preserve this important Chacoan Outlier. And if we are successful in our fundraising efforts and raise more than the $45,000 needed to acquire the site, those funds will be allocated to the Preservation Fund, a revolving fund that supports the purchase of endangered archaeological sites and provides us with the resources to purchase sites, cover the cost of taking legal interest, and fence and stabilize the sites. The Joy of being able to touch the past. 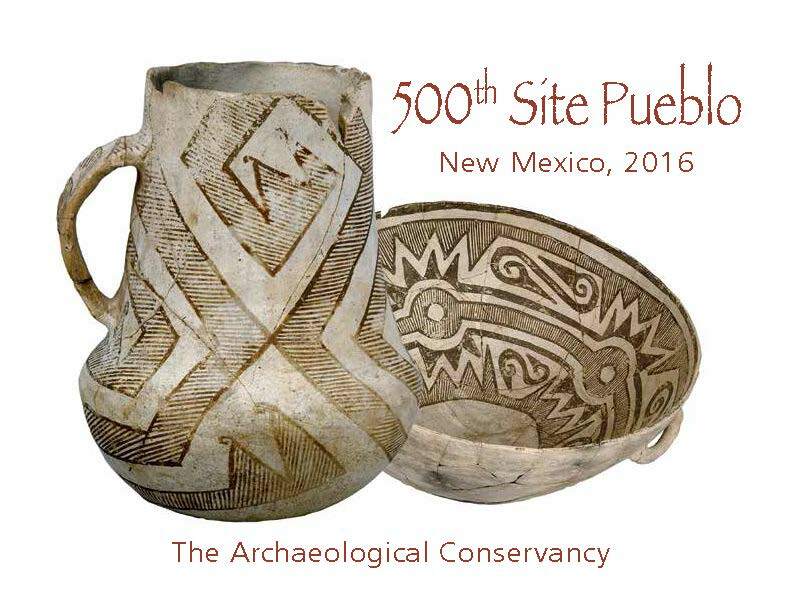 The 500th Site Pueblo is just one of the many sites we are currently working to protect. Irreplaceable cultural resources throughout the country continue to face increasing danger each day. Across the United States, population growth, agricultural and industrial practices, and development all contribute to steadily increasing land use. The ecological damage created by such factors is common knowledge, but the cultural losses we face are not often brought to light. Every day, the irreplaceable archaeological remains of our nation’s past are destroyed, only to be replaced by convenience stores and strip malls. But because of the support of our members like you, the Conservancy is able to preserve more and more of America’s cultural heritage each year. If you believe, as I do, that America’s cultural heritage is as important as ever, I hope you’ll help. The Conservancy has saved some 500 sites in 45 states since it was founded in 1980. 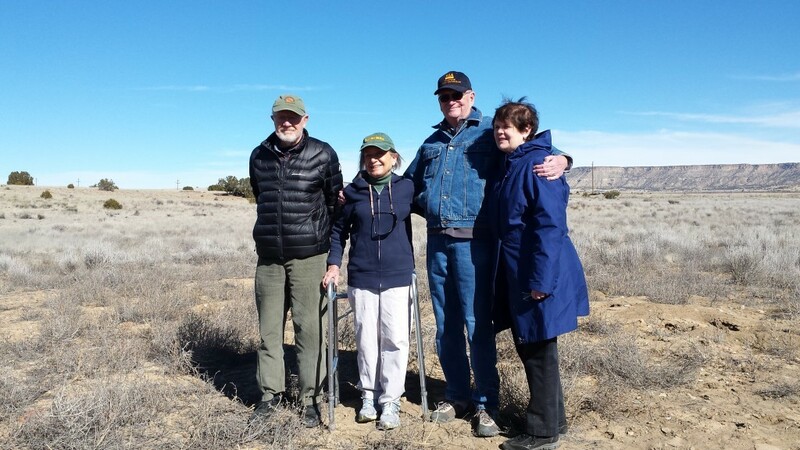 It’s because of people like you that these sites are now permanent archaeological preserves and that their stories are preserved for future generations to reveal. And it’s the continuing support of people like you that make it possible to save even more of America’s cultural heritage before it’s lost forever. Our Amazing Board Members on site. Thank you for all Your Support! Previous articleArkansas Archaeologists Find the Remains of de Soto’s Cross ? congratulations!!! Thank you for your awesome work!!! !